In my files I have a yellowed letter dated Sept. 10, 1978, from the office of the sixth prime minister of the State of Israel. An embossed seal, with olive branches cupping an ivory menorah, crowns the elegant letterhead. “Dear Ms. Arellano” (my maiden name), Menachem Begin’s secretary had typed. “Before leaving for Camp David, the Prime Minister asked me to thank you for your letter of August 6 and for your sentiments and good wishes.” I blush to remember those sentiments. Newly enthralled by everything religious, I peppered my Jewish friends with questions about their traditions and history. I signed up for a Hebrew language class and pored over books and articles on the Holocaust, Zionism and the State of Israel. It was a compelling narrative: God was rescuing his chosen people, just as my highlighted and underlined Bible verses said he would. In this state of spiritual exaltation, I wrote Mr. Begin. I told him about my studies and the Zion tree my roommate arranged to have planted “in the fallow hills of Jerusalem” on my 20th birthday. I thanked him for his leadership and concluded by saying that I hoped to visit the Holy Land someday. All that passed, as youthful obsessions often do. After college, I returned to my comfortable Catholic faith and gradually forgot about my Zionist leanings—until this summer, when I received an invitation to visit the Holy Land. It did not come from Israel, though. I was invited by Palestinian officials to join a faith-based tour for Christian journalists. A tour hosted by Palestinians? I was skeptical at first, but a few e-mail messages confirmed that it was a legitimate event backed by the U.S. Agency for International Develop-ment. It was part of a new initiative to revive the Palestinian economy, beginning with the tourism industry. Even the Israelis were on board under the banner of “economic peace” in the Middle East. So I went. But almost immediately I found myself fretting about unexpected things. Like the Jewish settlements. When the guide announced that our bus was passing a settlement on the left, I leapt out of my seat on the opposite side for a better view. At first, I couldn’t locate it. Then the guide pointed to a massive compound straddling a hilltop in East Jerusalem. It was disorienting. My mental image of a settlement was of a humble farming community in an uninhabited desert place, not a modern city of 40,000 on prime real estate. It is probably an exception, I thought to myself. But I could not help wondering: Is this where my Zion tree ended up—on one of these “fallow hills”? Then there was the separation wall. The 440-mile concrete and coiled wire barrier was an arresting sight from either side. 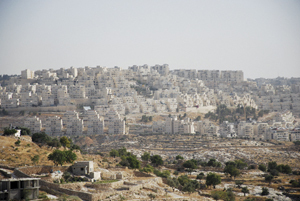 The guide claimed it choked commerce and isolated Palestinian families: “It’s like living in a prison or a ghetto.” I bristled at his choice of words. A more balanced account would have allowed that the wall prevented terrorist attacks, I thought. Still, it was an eyesore. As the days passed I grew increasingly irritable. The guide’s monologues on the suffering of the Palestinian people, confiscated lands and bulldozed trees were annoying. I was here to see the holy sites of Judaism and Christendom, not to listen to propaganda. By the time Israeli soldiers boarded our bus at a checkpoint outside Ariel, I was in no mood for political games. At all the other checkpoints, soldiers had merely glanced at our passports and waved us on. This time we were asked to disembark with all our personal belongings. Grumbling, I collected my bags and followed my companions across the steaming asphalt to a cinderblock security station. We queued up to file through the lone metal detector, then waited to be interrogated by a stone-faced senior officer as she rifled through our bags. “Where have you been?” she asked. “Where are you going? Why are you going there?” An hour later we were permitted to return to the bus but were denied passage. “Why wouldn’t they let us pass?” I asked the U.S.A.I.D. representative accompanying our group as we headed back to our seats. I regretted my words at once. After an awkward silence, the U.S.A.I.D. rep answered, “We don’t want to do that. He hasn’t done anything wrong.” He was right, of course. I reddened and slunk into my seat. What was happening to me? My ire should have been directed at the Israeli soldiers who had blocked our passage in order to protect the—for the first time I saw the need for a descriptive adjective—illegal settlers. Instead, I had turned on the Palestinian guide. I slipped away from the group early that night to think. Reluctantly, I admitted to myself that I had never moved beyond my youthful biases. If anything, much of what I had seen on television or read in newspapers since then had reinforced them: Israelis are our friends and noble allies; Palestinians are uncivilized and unreasonable—a “problem” to be dealt with. In the past few days, I had seen and heard things that challenged my biases, but I was afraid to let go of them. The next day and from that day forward, I made an effort to engage our Palestinian guide and hosts in conversation. Where before I had huddled with my American companions, I now sought out and sat beside the Palestinians at our gatherings. It was difficult at first. I think my hosts sensed my discomfort, my self-conscious attempt to reach across the divide. But they were eager to talk, to tell their stories. As they described the joys and challenges of their daily lives, I carefully wrote down their Arabic names and studied their lined faces. I leaned in when they showed me photographs of their children, and I shared photographs of mine. One night I recited a poem I had copied into my spiral notebook, “The Plea,” by Sue Sabbagh. My dinner companions nodded appreciatively and printed the names of their own favorite poets in my notebook: Imru’ al-Qais, Al-Mutanabbi, Mahmoud Darwish. Slowly my defenses melted away. The more Palestinians I met and the more closely I listened, the easier it became to dismiss my sad caricatures of rock-hurling fanatics and fundamentalist terrorists. This does not mean that I am now anti-Israel or pro-Palestine. If I learned anything this summer, it is that there are legitimate arguments and grievances on both sides and a dizzying history I’ll never master. The only thing I am fairly certain of is that Palestinians and Israelis will be living side-by-side for years to come. It will take a miracle for lasting peace to settle here, but this, at least, is one thing on which all who have any stake in the Holy Land agree: miracles have taken place here before. I will forever remember one young mother, beaming with pride, who gestured to a seat beside her and said in her charming English, “Will you please to enjoy us here?” As I smoothed the fuzz on her infant’s perfect head, hope swelled in me for her, for her infant son, for all who live in this scarred, contested land. When I started reading Ms. Von Stamwitz’s article I had great hopes that it would shed some needed light on the great injustices that have been done to the Palestinian people over the past 60 plus years. Although the article did open the door, ever so slightly, to some understanding of the humanity of the Palestinian people, overall the article was disappointing. At the conclusion of her article Ms. Von Stamwitz states that, “I’ll never master” the “dizzing history” of “the legitimate arguments and grievances on both sides”. For some enlightenment I suggest she might start by reading “The Ethnic Cleansing of Palestine” by the noted Israeli historian Ilan Pappe. She might then follow up with “Witness in Palestine, A Jewish American Woman in the Occupied Territories” by Anna Baltzer. The injustice of what has, and is, going on in Palestine will spur any right thinking Christian to want to right the awful wrong that has been done. Reading these books will do much more than just “dismiss my sad caricatures of rock-hurling fanatics and fundamentalist terrorists”. Ms. Von Stamitz also states, “It will take a miracle for lasting peace to settle here”. Rather that merely hoping for a miracle, Father Donald J. Moore in his October 12, 2009 America article, “When Silence is Betrayal” made this concrete suggestion: "
Get involved in a sustained nonviolent campaign of boycott, divestment and sanctions. As one Israeli activist put it: Convince your friends, your churches, your mosques and your synagogues to boycott products from Israel, especially from the settlements. This program is not anti-Semitic or anti-Jewish. It is a program to support the many Jews and other people of conscience who oppose the oppressive policies of the State of Israel. Speak to your politicians and to local government officials. Write letters to your local newspaper. Be alert when shopping in your local supermarket, or have a talk with its manager. Sanctions and divestments from corporations like Caterpillar and Motorola have made headlines, but you do not have to wait for decisions of the stockholders or for President Obama to implement a new policy on Israeli settlements. I got the sense that Father Moore was far more outraged by what he saw in Palestine than Ms. Von Stamwitz. Perhaps she didn't visit the right place. I hope that she will visit Palestine again, this time spend time on the West Bank & Gaza, ( as did Anna Baltzar), and then write again about her experiences for America. Alicia, I just returned from an Israeli-sponosred trip to the Holy Land for Catholic journalists, so I was quite interested by your comments. I wish that we could have each participated in each other's trips. Our guide and driver were not allowed to accompany us to Bethlehem, since Israelis are not allowed into the Territories. As the days went on, I became keenly aware of the level of propaganda that we were hearing, and of how archeology can be used for the purposes of propaganda (the December 2010 issue of National Geographic has an excellent article on that topic when it deals with "The City of David" which I had read before I left, and that tiny bit of insight was a real hermenutical key as I listened to the various explanations of the sites we visited). I found great irony in the fact that the trip had been billed as "spiritual, non-geopolitical" and actually wondered (and continue to wonder) if anything in that land could ever be non-geopolitical and if the geopolitical could ever be disentagled from the religious, regardless of how secular the perspective. That may be simply great naiveté on my part. In particular, I became conscious that the Palestinian population had been "non-existed" (in the sense of "disappeared"). It was an eery, unsettling feeling, particularly strong at the amazing sound and light show on the history of Jerusalem at the citadel - which simply fast-forwarded over several centuries of history to arrive at today's reality with no mention of the Palestinians who lived there in the 20th century and before. It was even more distressing because we really didn't get to meet the Christian population of the Holy Land, with the exception of a couple of excellent people with the Franciscan Custody, and a few of the merchants in the Arab market in the Old City during the last few hours of our trip. So we really had no opportunity to speak to others, and hear other stories. I'd also like to express my appreciation to America for the consistent way in which you give voice to the reality of the Christian communities in the Middle East. Truth to tell, the amount of coverage you give to this topic hadn't really hit me until I was invited on this trip and was flipping through some back issues of the magazine. Thank you. Very touching account. i especially appreciate the way that Alicia related the personal story. Not just talking about "those" folks but using their names, entering into relationship. Isn't that the only way we will be able to break down those walls. This was an enjoyable and informative overview to read. And it is hopeful for the future. I say future because at the present time the factions which control the Palestinian movement are not the ones above but the powerful minority whose desire is to drive the Jewish people into the sea, and an Israeli leadership that in turn wishes to build new settlements. Until these two groupings are replaced, more suffering will be in store for both of these long-suffering populations. This article also appeared in print, under the headline "Waking Up in Jerusalem," in the February 21, 2011 issue.